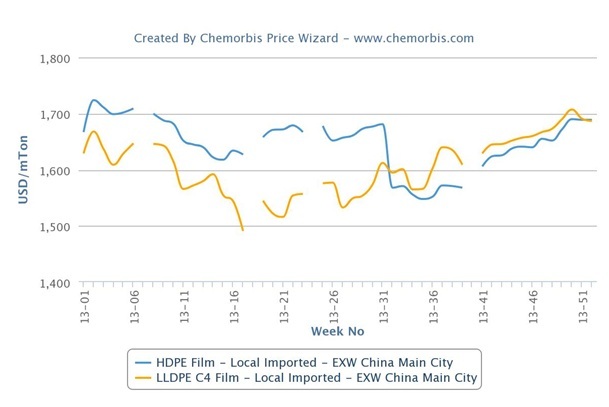 In China, locally held LLDPE film prices started to gain ground over HDPE film prices both in the local and import markets in the last week of July as per the pricing service of ChemOrbis. However, this past week, locally held HDPE film prices reached par with LLDPE film prices as HDPE prices rose and LLDPE prices came down. Firmer global sentiment and rising spot ethylene prices triggered an increasing trend on LLDPE film prices as of mid-May. Plus, LDPE film prices were increasing at the time due to tightness stemming from limited Iranian cargoes and an extended shutdown at a Thai producer’s LDPE plant following a technical issue. As a result of these bullish factors as well as the firmer LLDPE film futures prices, both domestic and overseas producers sought additional price hikes. 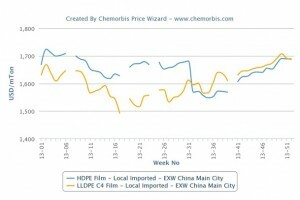 Since mid-May, local LLDPE film prices started to rise and they matched HDPE film prices by end July. After that, local LLDPE film prices continued to increase when compared with HDPE film prices and they maintained their premium until the last two weeks of 2013, when they again came on par with HDPE film prices.